So now that we've discussed the value of wear and resilience in carpet yarn, this week we will touch on stain resistance. Stain resistance has taken on added importance these days as family's lifestyles are getting busier and more hectic. There was a time that most family's wouldn't let you eat in the family room much less the living room. Do you remember as a kid how if you tried to take some food into the family room to watch TV while you ate, your mother would let you know about it. Food and drink just weren't allowed in carpeted rooms. Because of this, wear and resiliency were more important than stain resistance. These days, everybody eats in the family room. They eat in the living room. And in our bedrooms. And the basement (which are mostly carpeted these days). We pretty much eat everywhere in the house. Because of this (and the resultant spillage. Yikes) carpet has to be stain resistant. What good is carpet that will wear forever if it stains up like crazy. 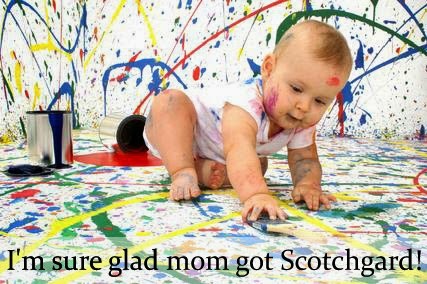 Scotchgard was one of the first stain protections developed. It was a topical treatment that provided a barrier between dirt, stains etc and the carpet yarn. This barrier stopped stains from penetrating into the carpet as long as you cleaned up the spill relatively fast. Dirt also cleaned off of the carpet. One of the drawbacks to this topical treatment was that after a couple of cleanings, most of the topical treatment was gone leaving the carpet yarn exposed to future spills. Along came the built in stain protection. Stainmaster, Anso, Weardated and Scotchgard Stain Release were the top brands in built in stain protection applied to mostly nylon carpet yarns. Basically how this worked was that the yarns were treated with a fluorocarbon system. Most carpet yarns when they are extruded will have very fine pores. These pores will absorb spills and are hard to clean out. This is the idea behind hot steam extraction. Hot steam penetrates the yarn and cleans as the steam is extracted out of the yarn. The built in stain protection basically filled these tiny pores thereby creating essentially a solid yarn. This solid yarn won't absorb spills. The stain will stay on the surface of the yarn and is easily cleaned off with a good carpet cleaning solution. Most nylon yarns are treated for stain resistance in this way. Polyester on the other hand is inherently stain resistant. PET polyester is made with recycled pop bottles. A form of plastic. This yarn is extremely hard to stain. Because of polyesters superior stain resistant properties, this yarn is starting to take market share away from nylon (the fact that polyester costs less than nylon doesn't hurt either). Wool, since it's a natural yarn and hence porous, will absorb stains and is probably the worst yarn for stain resistance. The top three are considered extremely stain resistant and will suffice for most carpet installations where stain resistance is the top priority. Next week more on solution dyed nylon.........the best carpet yarn period (in our humble opinion). Today we explore the heat set in carpet yarn! With the proliferation of polyester carpet yarns we want to set the record straight today about which carpet yarn is best (in our humble opinion). While every carpet yarn has pros and cons, there is still a yarn system that we feel outperforms all others. The mainstream carpet yarns are nylon, wool, polyester, triexta (a form of polyester, more on this later) and olefin. Nylon is still the best wearing yarn out there. It is almost impossible to wear out with normal residential wear and it has great resilience. Most carpets never wear out but they will "ugly" out. The carpet mills consider wear out as carpet fiber worn away. This can only happen with abrasive wear and is the main reason why you should clean your carpets every 12 to 18 months. To get rid of all of the dirt particles which can act like sandpaper to your carpet. 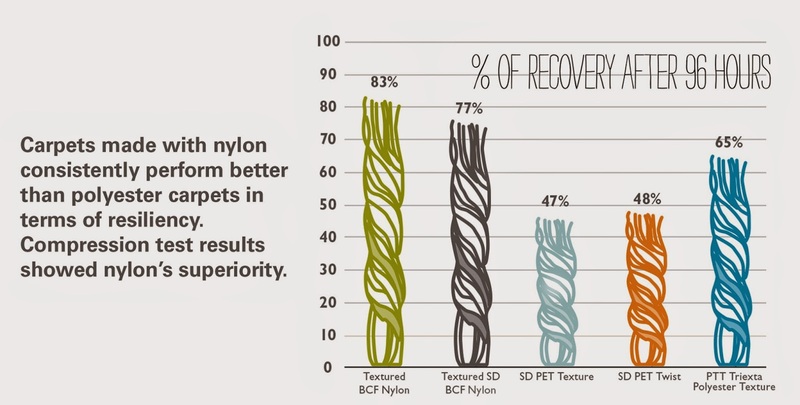 Even though nylon yarn is the hardest to wear out, it's nylon's resiliency that is it's greatest feature. Most carpet yarns are heat set. What is this? When you separate the carpet yarns in your carpet you will see that each individual yarn has been twisted. Kind of like a rope. The carpet mills have determined that the yarns are so much stronger when they are twisted together. This is great as long as they stay twisted together and this is wear nylon yarn shines and heat set comes into play. To keep the yarns tightly twisted together, the mills have heat set the yarns. As you know, if you cut a rope that is intertwined, it will fray at the ends. The more it frays the more it starts to unwind and pretty soon your rope isn't worth anything. The same with carpet yarns. In a cut pile carpet, each yarn end (like in the rope example) is cut. So the yarn wants to unwind and fray with normal foot traffic. As they unwind and fray, the carpet starts to ugly out. It will look worn and just plain ugly. No way to fix this. You will have to replace the carpet. Now, with heat set, the mills have "set" the twist in the yarn with heat. The higher the heat, the longer the yarn wants to stay twisted. So the higher the heat, the longer the yarn stays twisted, the longer a carpet holds up to foot traffic, the longer the carpet will look good and longer the carpet will last for you. As you may have guessed by now, nylon yarn can withstand the highest heat levels and so will keep it's twist level longer than other yarns. If you were to set the heat level the same for a polyester carpet, the yarn would melt. So even though polyester carpet yarns are heat set, they are heat set at a lower heat level than the nylon yarns and hence will not stand up to higher foot traffic when it comes to maintaining it's look. And because nylon carpet yarn stands up better to higher wear (keeps it's look longer, doesn't ugly out as fast) it will last longer than other types of carpet. The longer a carpet wears, the longer it will last for you and the less often you will have to replace it, thus saving you money in the long haul. So when it comes to longevity and what type of carpet will stand up best to wear and look good the longest, nylon yarn is still king of the heap. So if wear and resiliency are the most important factors for you when buying a new carpet then nylon should be your choice! Next week we discuss stain resistance as another important factor in determining the best carpet yarn.